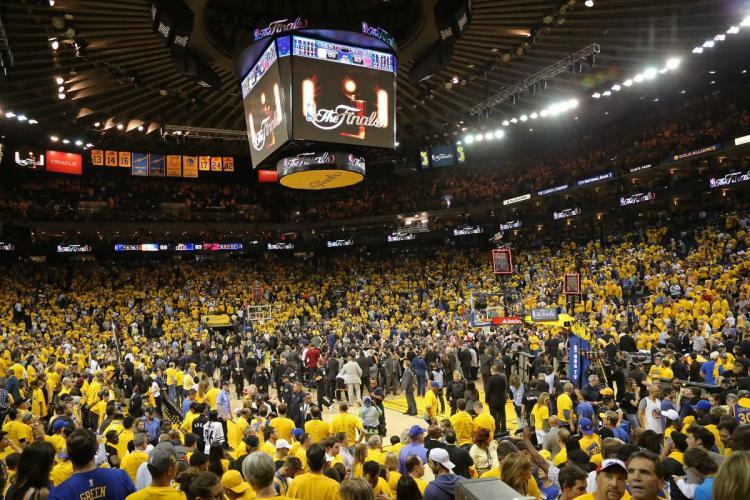 *A fan was pushed over a second deck railing during a fight with another fan at the end of Sunday’s Game 7 of the NBA Finals at Oracle Arena, reports the San Jose Mercury News. A man in his early 20s was in critical but stable condition at Oakland’s Highland Hospital after falling from the second deck to the first deck, apparently after another fan pushed him, Oakland police spokeswoman Officer Johnna Watson said. So far, no word on what started the fight, which began after Cleveland won the game. According to TMZ, one witness tweeted that she saw blood coming out of the victim’s ears. Police were interviewing witnesses and reviewing surveillance footage late Sunday, and no arrests had been made. Any witnesses to the fight are asked to contact the Oakland Police Department’s Assault Unit at 510-238-3426.